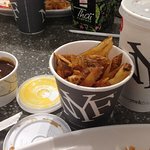 There aren't enough food, service, value or atmosphere ratings for NYF, Canada yet. Be one of the first to write a review! This is one of the places where you get your orders right away. I appreciate the fast service but fries are a bit overcooked. Unpleasant experience, found a long black hair in an overpriced Fries bucket. No need to elaborate on service and quality of food etc. Will definitely not return. Had a good chicken burger. Lots of toppings, and good service. That being said, I still thing that Big Smoke serves a better chicken burger. Their fries are lower in transfat than other places that serve fries but their cheese sauce is a little annoying. I like cheese but their sauce is a little too mucky. It tastes okay though. Not bad. Just fries, but good fries. The new poutine was way too spicy for my liking and I did not really enjoy it. the poutine with the beef added was really yummy though. The poutines are a meal in themselves, you will not need anything else to go with them. The quality of these franchised fries from location to location is petty much consistently excellent ! This particular location does not disappoint! 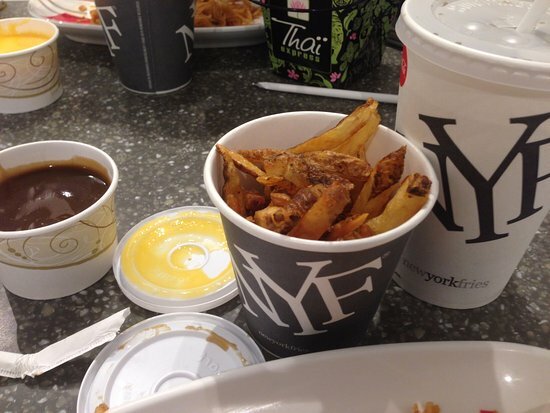 Get quick answers from NYF staff and past visitors.